Hard work, luck, love, intuition and an entrepreneurial spirit have all played a part in Kevin McCarthy”s success as a winemaker – but knowledge has always underpinned it, he says. Kevin's brother, Simon, followed him in the science department, completing a PhD in physical chemistry, and his son Vincent is now studying environmental sciences. A friend from Monash introduced Kevin to a winemaker after he had graduated and was at a loose end. "The production side grabbed me within seconds of seeing it. The nuances of what is in the fruit that you can then realize is in the wine is fascinating." Parents who loved good food and a father who had an almost reverential attitude to wine also influenced him. He undertook a degree in Oenology at Roseworthy College, then in the Barossa Valley, graduating in 1983 at a time when the wine industry was struggling and jobs in it scarce. 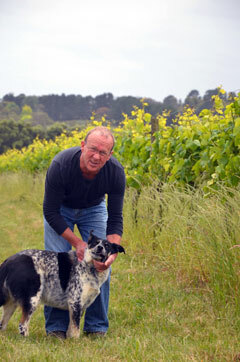 He managed a small vineyard in Queensland next door to where winemaker Kathleen Quealy worked. The couple married in 1986 and moved to the Yarra Valley where Kevin was employed by respected vigneron James Halliday at Coldstream Hills. They relocated to the Mornington Peninsula in 1988 to open their own winery, T'Gallant, where they planted Pinot Gris grapes, a variety that was almost unknown here. "It was regarded as crazy, sheer madness." They proved the sceptics wrong with their first harvest in 1993. The wine was well received, became commercially successful and was a "perfect niche". Kevin says that when they started out he and Kathleen weren't at all "business savvy" but learned as they went, particularly from partners who invested in the brand in 1994 who were business people. "You had to learn," he says. "It was brutal – survival of the fittest." Fortunes in the wine industry picked up and by 1995 the wine boom in Australia was in full swing. "We rode that beautiful wave and sold at the end of the boom." Beringer Blass, a major division of the Foster's Group, bought T'Gallant in 2003, although Kevin still works for the brand. Three years later they started a family business at Balnarring, run by Kathleen and their son Thomas. Kevin's interest in science never waned. In 2007 he worked with the Australian Wine Research Institute to pioneer an objective measure of wine style – or "new language" – called the "Pinot G Style Spectrum". He says he couldn't have done that without his first degree, which has helped with business decisions too. "The more you have studied, the more you know and the better placed you are to trust your gut." Being innovative, although with some initial trepidation, has always been important to the wine-making couple, "part of our nature in a big way". Kevin, who has spent time in Europe soaking up advice from other winemakers, recommends that science students learn more by seeking out inspiring lecturers or people in their chosen industry.